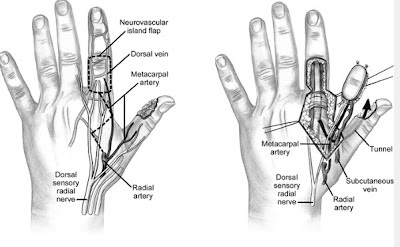 Based on the first dorsal metacarpal artery axial pattern flap, which can be sensate if we take the accompanying nerve – to cover a defect at the tip of the thumb. 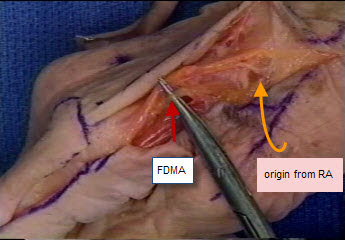 3) No need to dissect the fascia looking for the FDMA or even to follow it back o the radial artery as it can damage up your flap ( one glance is enough ) have a faith in its presence. 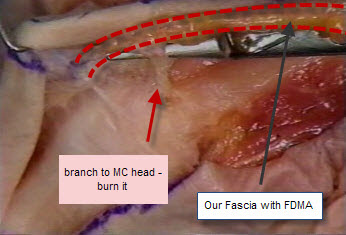 4) There will be another branch coming out at the level of the 1st Metacarpal head which you will need to ligate or burn. 9) Close the primary wound and cover the flap site with split thickness skin graft. You can Use doppler to locate the vessel insted of destroying the surrounding tissue.